In 1886, a Scottish author named Robert Louis Stevenson penned a short novel that was to become a historical and stirring psychoanalytical study of the darker side of man. Then, in 1990, Robert Weil, inspired by this macabre tale of the complexity and depth of man’s innate duality, sought to learn more about the conflicting nature of the human condition. As he did research, he continued to be inspired by other writers who’s historic works touched on this enigma, “War and Peace” (Tolstoy), “Sense and Sensibility” (Austen) and “Green Eggs and Ham” (Seuss). 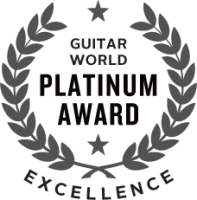 As all of these works now belong in the pantheon of history’s great literature, he sought to make some kind of contribution of his own that would also stir the inner heart of man…, woman…, and guitarists everywhere! 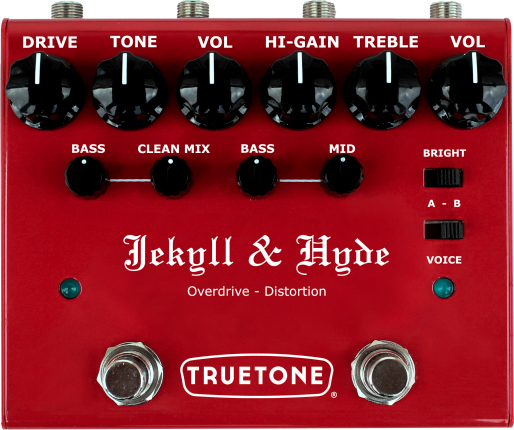 So…, in 1997, in a small house in rural Connecticut and with echoes of the works of Mary Shelley still driving his subconscious, Bob started to assemble his first Overdrive and Distortion pedal on his kitchen table (to the great chagrin of his wife). Though it might’ve seemed unnatural at the time, he knew that these momentous, individual circuits may yet coexist well together. And he could not think of a better place that these two, seemingly independent effects, should come together than in a single, glorious housing, shaped like home-plate. 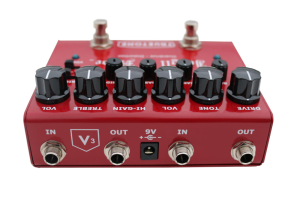 Had he known that his pointed creation was destined to rock stages and YouTube channels everywhere, he may have had second thoughts about using it’s aptly named and somewhat nefarious sobriquet…! It soon became important to note, however, that this pedal differed from the classic horror story in two significant ways. First…, in Mr. Stevenson’s novel, the mad scientist has no more control over his actions than that of a drunk baby. On the other hand, this dual-pedal gives you bags of control over every aspect of its operation. Secondly…, Dr. Jekyll could never appear at the same time as Mr. Hyde because they were the same person. However, in this incarnation of the Jekyll & Hyde partnership, you are able to invoke it’s individual circuits simultaneously…, to monstrous effect! As you heave open the creaky old door of this pedal’s history, move cautiously through our poorly lit lab, and clear the dust that’s somehow settled in your ears, you start to discover the horror and wonderment that dwells within its fiendish designs. Since its original incarnation, both Bob and our resident mad scientist, R.G. Keen, have been hard at work fabricating this pedal from scratch (not once, but twice) over the past 20 years in order to keep up with the ever-changing standards of Rock-n-Rolldom. If you were lucky enough to have owned the nefariously classic “Silver Version” of this pedal, you’ll still find solace in that even in this latest iteration we have made sure to preserve its original (and somewhat evil) intent. We can wholly guarantee, the V3 version has more rage pent up inside it than a guy named Jack who has decided to spend the weekend in Whitechapel. And while we’re touching on inspired works from across the pond, our angry right hand man, Mr. Hyde (who is obviously the more “Distorted” of this gritty pair of colleagues), can deliver to you a rich gift of saturation reminiscent of bands a-la Metallica, Avenged Sevenfold, AC-DC, Radiohead, and more. Equipped with Hi-Gain and Volume controls, along with Three-band EQ, you can achieve every JCM800 inspired tone that your creamy or scooped heart delights! And just to add a little seasoning to the pot, we’ve also thrown in a “Bright” switch (to make him scream) and a “Voice” switch (to contour the amount of natural compression). 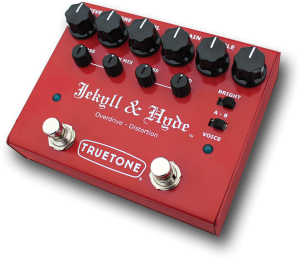 And as for Dr. Jekyll (the Overdriven chap on the left side of this pedal), we’ll just say that he’s “Open” to experimentation. 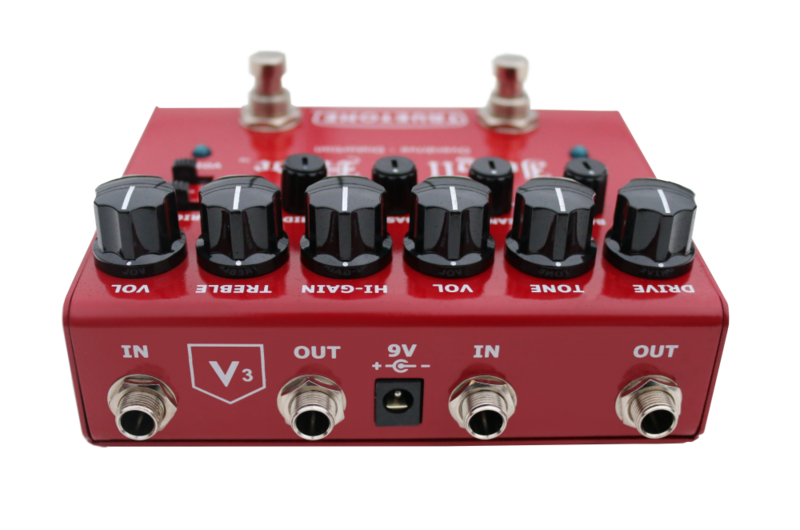 More “Ampy” sounding, it’s better to treat him like the Pre-amp on your favorite American rig. You can round out his personality though, with a sweepable “Bass” knob and also experiment with the “Clean Mix” knob (to layer in subtle, naughty bits of saturation without losing the character of your original signal). On this…, you can be sure. To be in the company of these men…, um…, this pedal…, is to inveigle the very boundaries of self-control. You will, at some weary point, feel the persuasive call to rock the free world, and that’s the moment when you will surrender to activating both channels of this pedal at the same time. But if you dare to tempt this twisted fate, you may feel it’s spirit encapsulate you, calling you to double tap, to hammer-on, or even Drop ‘D’ in public. Ohhhhh…, the horror and majesty! With this life-altering pedal in your arsenal, you shall be the “Master of Puppets“. Some may hear you and call you a “Creep“, but in the end they will be “Thunderstruck” and will be singing “Hail to the King“! Like the good Doctor of the story, you may also find that this metamorphosis eventually becomes permanent…, but we think that you will come to accept this mantle (upon seeing the frivolity & moshing commencing)! Rock on gentlefolk…, Rock on…!! • Each channel can be set to either True Bypass mode or buffered, via internal switches. 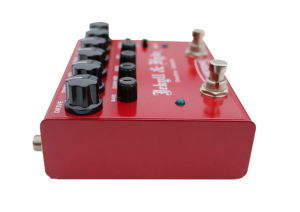 The buffered mode utilizes our legendary Pure Tone circuit. • Limited Lifetime Warranty… even for second or third owners. Note: All dimensions are approximate maximum dimensions. Current draw is shown from bypass to channel(s) on.